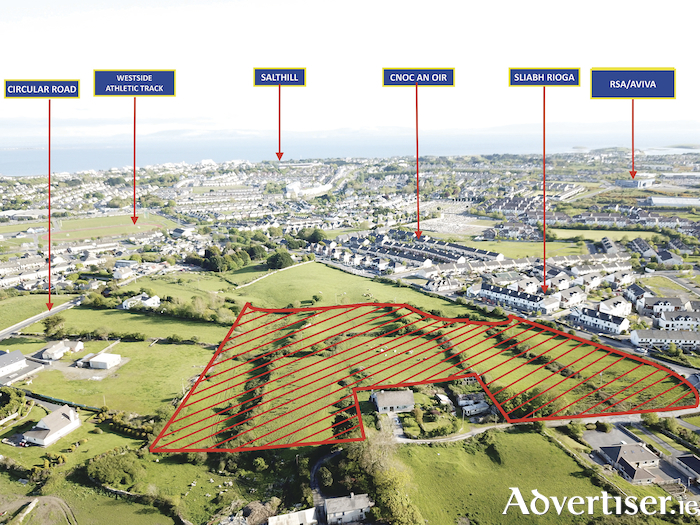 Galway city based estate agents DNG Maxwell Heaslip & Leonard and Joyce Mackie & Lougheed have been instructed to bring to the open market by tender c7.04 acres of zoned residential development lands on the Letteragh Road in Rahoon. On the immediate western outskirts of Galway city, the land is currently used for agricultural purposes and fronts on to the Letteragh Road in the Rahoon/Newcastle area, approximately 3.5kms from Eyre Square, and close to Westside Shopping Centre, NUIG and UHG. Under the most recent Galway city development plan 2017-2023, the lands are zoned residential with huge development potential. All services are available to the site with the surrounding area comprising primarily of residential estates with a large number of well-established housing developments in the vicinity. Without doubt, one of the highest profile sites to come to the market in Galway in recent times, the property is strategically placed with easy access to Galway city centre and the main traffic arteries to and from the city. All access points to the city are close by with the N6 link road 2kms away. The lands are being offered to the market by tender on July 25 and joint selling agent James Heaslip expects considerable interest. "This is an excellent opportunity to acquire an outstanding development site with great potential," he says. "Galway still has a huge issue with the lack of housing available at present. The development of this site would go a small way towards easing the pent-up demand which is prevalent at the moment. The tender date is Wednesday July 25 at 12 noon with Jack Fitzgerald of Kennedy Fitzgerald Solicitors having carriage of sale. Tender documents are available on request by contacting James Heaslip of DNG Maxwell Heaslip & Leonard on 091-565261 or David Kennedy of Joyce Mackie & Lougheed on 091-562278.